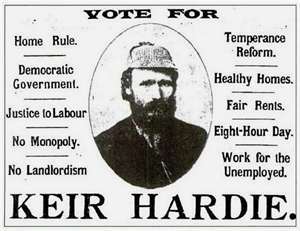 Next Wednesday 4 July it is not only the anniversary of the only successful British Revolution, it is also the 120th anniversary of the election of the first ever Labour MP Keir Hardie. Who was elected as the MP for West Ham South on this day in 1892. West Ham is in the London Borough of Newham the home of the 2012 Olympics. To mark the anniversary, members of the modern day West Ham Labour Party and Newham TULO are organising a free walking commemoration tour around Stratford town centre. Meet 7pm Wednesday 4 July 2012 outside the Old Town Hall, Broadway, Stratford, E15. Which of course was where the 1892 election count took place and it was from its open balcony overlooking the High Street that the result was read out to cheering crowds and Hardie made his first speech as a Labour Member of Parliament. The tour will be very informal and will take around 90 minutes following which people will be the opportunity to go for an optional meal at Manus Indian Restaurant in nearby West Ham Lane. Or a beer (or Temperance soft drink) or two may be purchased at the King Eddies or one of the other historic pubs in the area. PS We are still drawing up the itinerary - if you have any Labour Movement history sites to suggest we visit on route please let me know.